The engineer looked up at the broken heating line in the ceiling and shook his head. 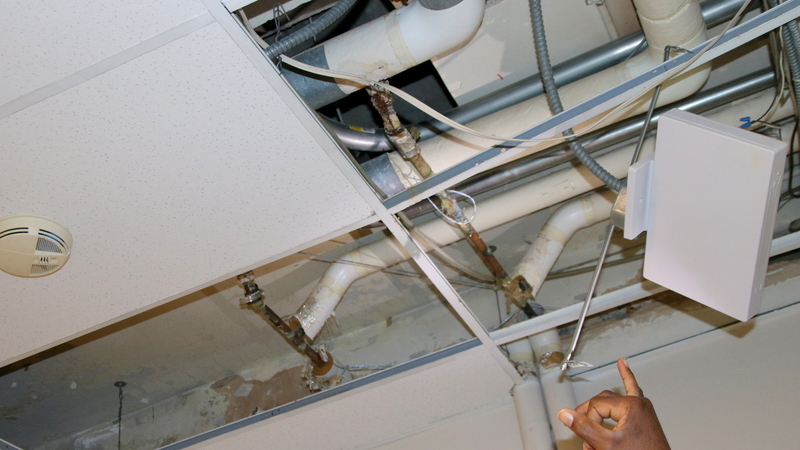 To safely repair this spot and other places where pipes burst at Frederick Douglass High School during the frigid winter break, his team would need to shut down the boiler and briefly cut off heat to the entire building. “The leaks right now aren’t, like, pouring water out, but they could bust loose and that’s why I want to do a shut-down,” he said, explaining his plan to a school custodian yesterday. Only one of the three boilers is currently working, the custodian reminded the engineer, who was still learning about the sprawling West Baltimore facility. 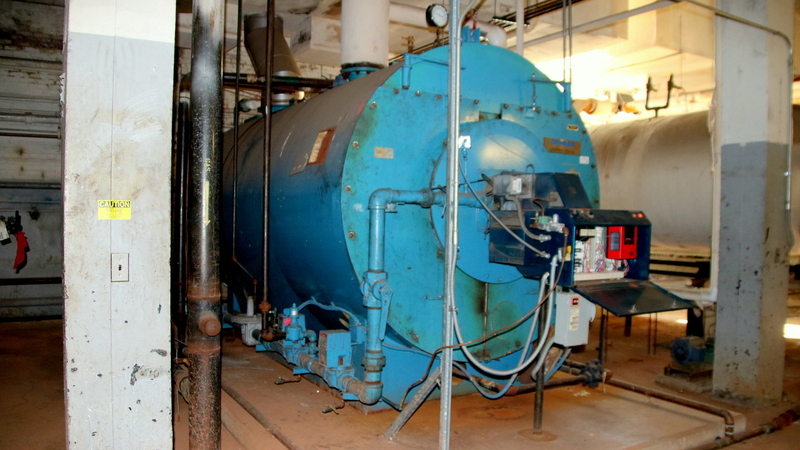 The engineer, who asked not to be identified, said his company has a contract to provide regular heating system maintenance for some city schools, but Douglass wasn’t one of them. 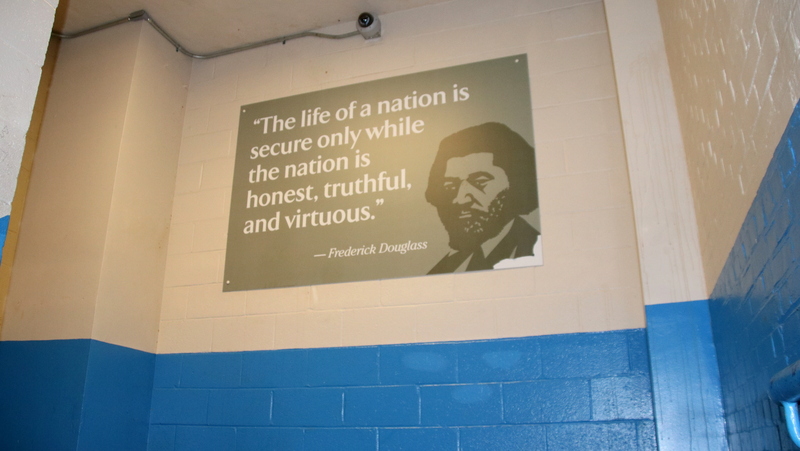 Frederick Douglass was one of about 60 Baltimore schools – roughly a third of the total – where heating and electrical problems were reported Tuesday when classes resumed after the week-long holiday. An array of private contractors, school employees and city workers have been working overtime this weekend to assess and repair schools where temperatures in some cases never exceeded 40 during classes last week. Images that went viral on social media of children in coats and hats at their desks pushed initially reluctant public officials to act. With parents and teachers calling on her to close all schools until humane conditions could be assured, schools CEO Sonja Santelises at first declined, saying she would not “knee-jerk-close” schools. Her administration was doing its best, given aging buildings and years of underfunding, to protect students, she said. Schools, for instance, provide free meals and safe spaces to kids who often need both, she pointed out. But Santelises finally did close schools on Thursday because of overnight snow. On Friday, she acknowledged the need for repairs. 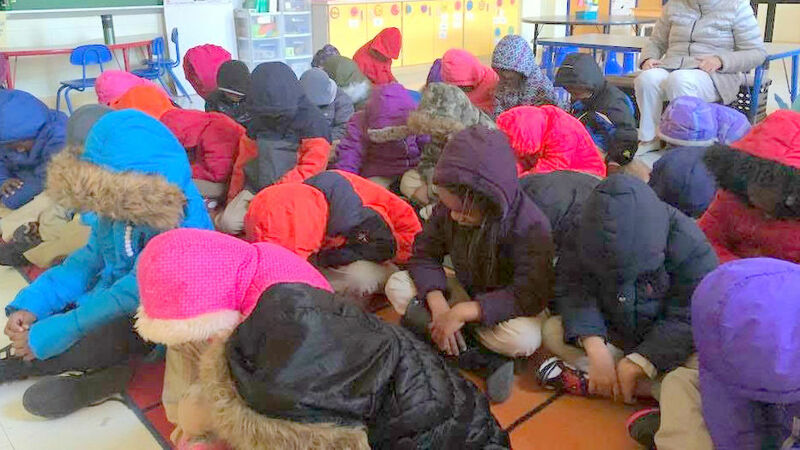 One of the photos of cold classrooms Baltimore teachers were posting on social media last week. Mayor Catherine Pugh also hung back at first, deferring to school officials and citing jurisdictional limitations. By Friday, however, amid the growing local furor and coverage in the New York Times, CNN and beyond, the mayor found her voice, expressing concern about the students and opening rec centers to provide free food. “I was dismayed to learn that the school system had no plan in place for dealing with what is fast becoming a crisis garnering national attention,” Pugh said in a letter to the City Council. Calling on Santelises and the school board “to assess and account for how appropriated maintenance funds are being spent,” Pugh waded into the politically charged debate over who was to blame. 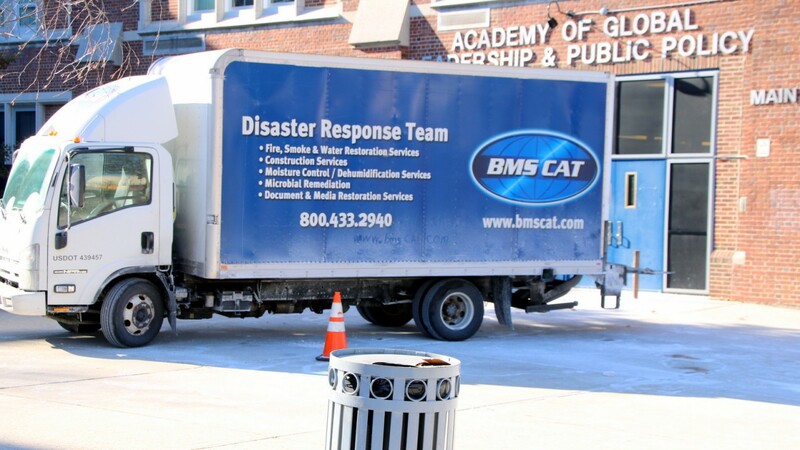 She also dispatched city engineers and Department of Public Works employees to assist the school facilities staff in readying the buildings for students tomorrow. 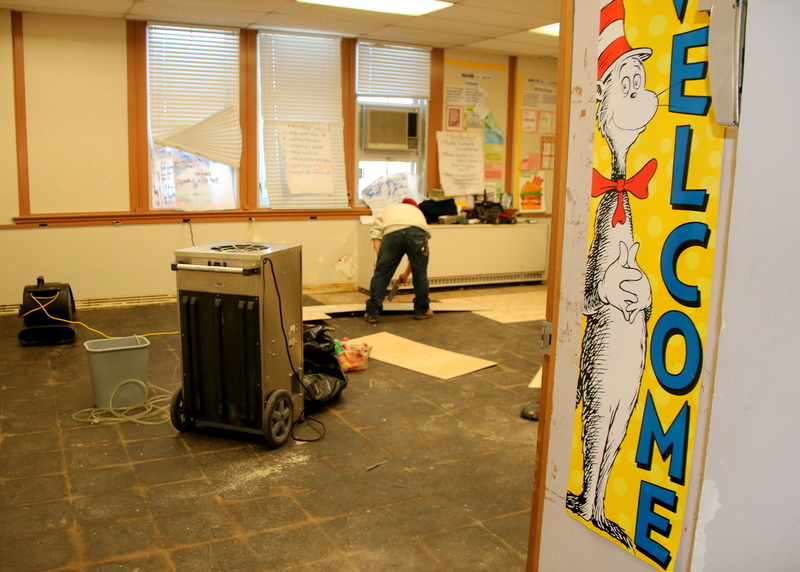 On Saturday at Douglass, it looked like the soggy classrooms were a long way from being ready to welcome students, but the place was abuzz with activity. 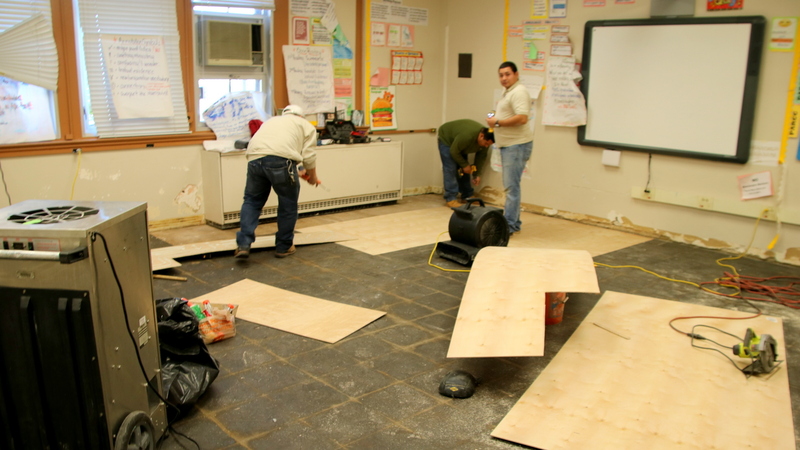 As the engineer and his team struggled to repair the heating system, other workers were installing new flooring and mopping up grime from the flood. Chairs and desks had been moved into the hallway and were protected by plastic. 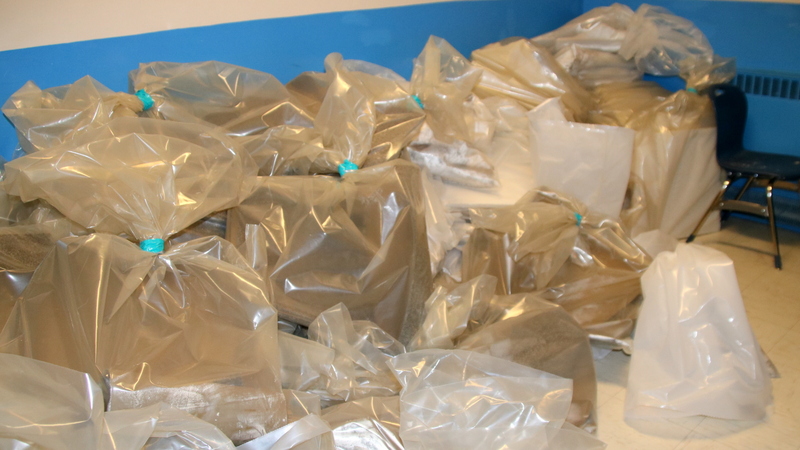 Sopping floor tiles and other material had been bagged and awaited removal. 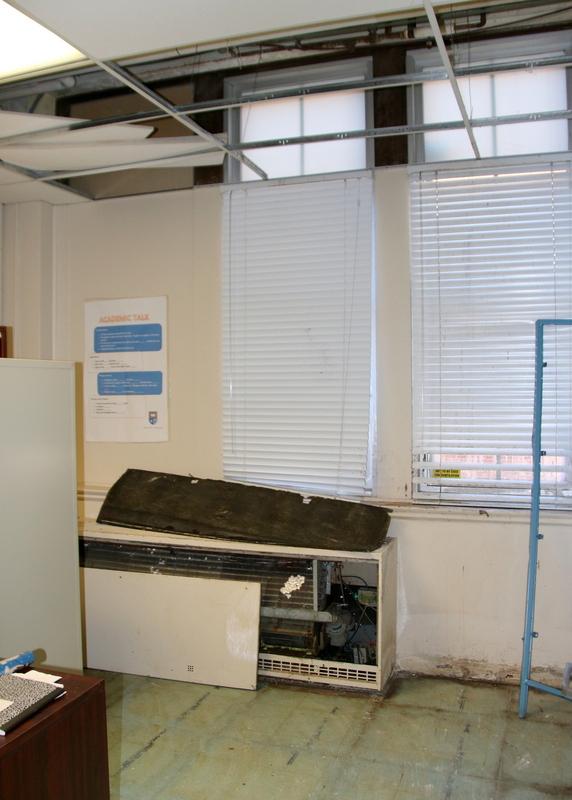 The building custodian picked his way past rooms that had been Exhibit A for the crisis on the Internet, such as the flooded weight room and the JROTC room. 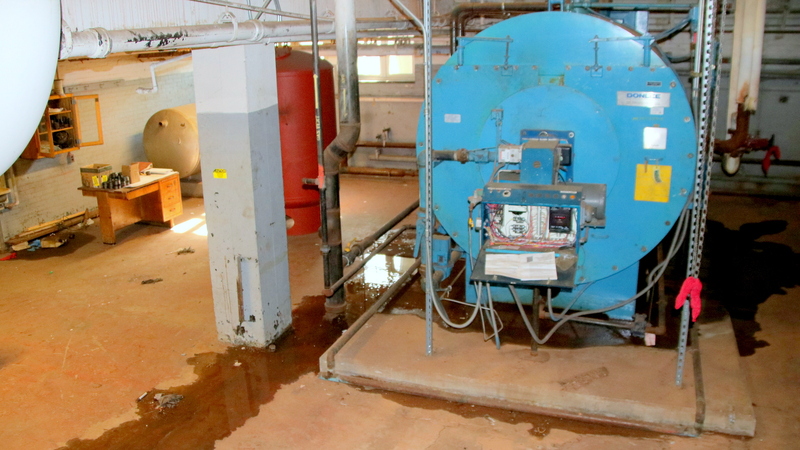 In the basement, he pointed out the three basement boilers, two of which sat beside a pool of water, non-functional. Above one heater that was said to have been shooting water like a geyser there was a large gap in the ceiling. “I’ve been doing buckets to catch the drips every day,” he said, raising his voice to be heard over the sound of the work crews. Will they be able to get the heat and the building in shape by Monday morning?